Ty Cobb played for the Detroit Tigers from 1905 to 1926. Tyrus Raymond “Ty” Cobb (December 18, 1886 – July 17, 1961), nicknamed “The Georgia Peach,” was a Hall of Fame baseball player. When he retired in 1928, he was the holder of 43 major league records. Cobb also received the most votes of any player on the 1936 inaugural Hall of Fame ballot. On May 12, 1911 Ty Cobb played against the New York Yankees in a game that exemplifies his unique skills and personality. Cobb scored a run from first base on a single to right field, then scored another run from second base on a wild pitch. In the seventh inning, he tied the game with a 2-run double. The Yankee catcher began vociferously arguing the call with the umpire, going on at such length that the other Yankee infielders gathered nearby to watch. Realizing that no one on the Yankees had called time, Cobb strolled unobserved to third base, and then casually walked towards home plate as if to get a better view of the argument. He then suddenly slid into home plate for the game’s winning run.” Stewart Wolpin, Ty Cobb, BaseballLibrary.com.” Ty Cobb was famous for his talent in stealing bases. In 1915, Cobb set the single season steals record when he stole 96 bases. That record stood until Maury Wills broke it in 1962. 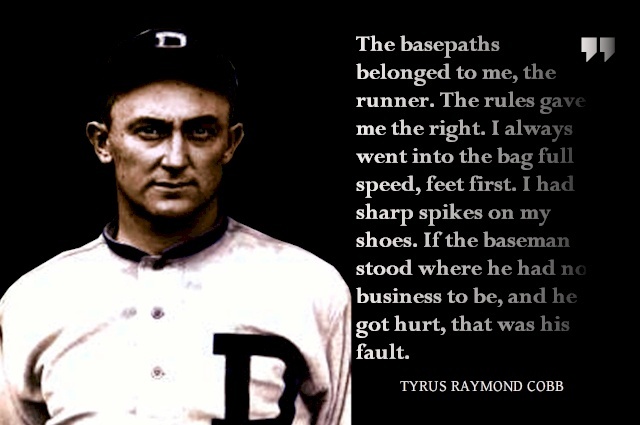 He would sit in the dugout and where the infielders on the other team could see him, and sharpen his spikes. Cobb was called “the dirtiest player I ever saw” by the normally reserved Connie Mack. Navin Field, later Tiger Stadium was the sight of his historic base stealing record. I hope that the citizens of Detroit and the city will find a way to immortalize this special corner to keep our amazing baseball history alive. After all. 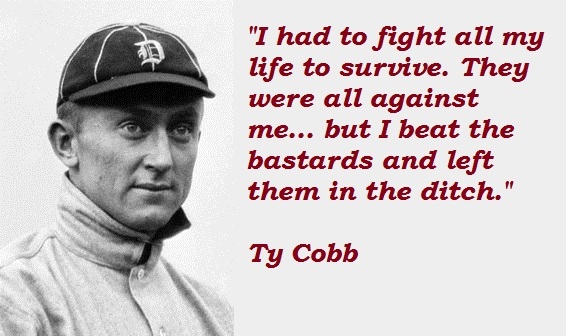 Ty Cobb fought hard for our Tigers- shouldn’t we fight hard to remember? This entry was posted in Detroit History and tagged 1915, 1920's, Baseball, detroit, Detroit Novel, Detroit Tigers, jean scheffler, Michigan History, The Sugar House, Ty Cobb. Bookmark the permalink. Thanks jean glad to have found your blog. Cobb clearly one of the greatest ever players as well as a monstrous man! Regards from Thom at the immortal jukebox (see duke snider tribute).